With her abundant passion and unfaltering determination, Tina is a force to be reckoned with. We were honoured to have Tina speak at our WEN Forum last year, where she emphasised the need for female and male voices to be equally weighted, as “communities thrive when balanced”. We strongly recommend a follow of her Twitter profile to keep track of her game-changing actions, and so you can join us in watching her lead by example. What do you envisage to be the biggest environmental challenge of 2018? Government. Opportunist and profit-driven industries will freely do what it takes to make money as the 'economy' is a more driving agenda item for our government than the health and wellbeing of the citizens. This becomes more obvious each day that we beat records on air pollution and tear down another natural space. But the industries doing the damage are only able to do so with the complicity of the government and so it is this that needs addressing I believe, in order to impact beyond one company/industry at a time. The situation we find ourselves and our planet in, is urgent and yet our system of government seems shaped to ignore cries for help that aren't economic. I don't have a solution but I do have clear targets. 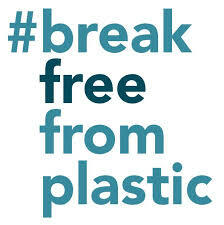 What is your top piece of advice for young female entrepreneurs in the green industries? You are doing the right thing, we all need your contribution if we are to succeed and the gratitude you won't always hear, is massive but you'll possibly be too busy to always notice it. There are so many who wish they could do what we do but are for a variety of reasons, unable; it is also for them that we power on. Remember too that we are literally 'defending our young' (whether existing or future children) - the urgency of this obligation and requirement for dedication is vital - but also very empowering as we are on the right side of real 'law' when we defend our young; to ignore this obligation would be negligent and criminal. Lastly... don't measure yourself against others - what you bring is an entirely unique piece of our diversity that will help complete the whole. Finally, which woman, friend, family or famous, has inspired you most? She doesn't have one name but I meet 'her' so often - she is the newcomer, usually an elder and nearly always a woman who felt she was nearly finished with her contribution to life... before realising how much more was left to be done - that would be best done by someone exactly like her. So many in our communities have been raised in a past that never valued them... amongst activists fighting to defend the future for our children, she rises to the challenge, commits to the obligation and inevitably brings perspectives and ideas that prove hugely useful. When 'she' joins us, it starts tentative but rapidly, she finds a role and place in this movement that is a bespoke fit, designed by her and around her unique abilities. EVERY role brings out the self-empowerment within that she may not have met before. THIS is the beauty of the job of removing the ugly threats. Tina Rothery is a mother, a grandmother and an auntie. When she heard about the dangers of fracking, her instinct was to protect her family and her neighbours. 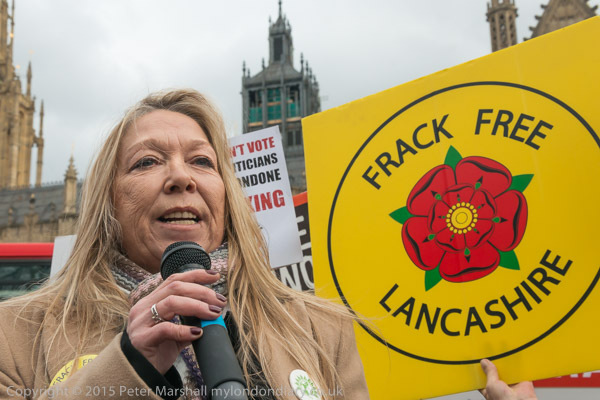 For six years, she has travelled all over the UK, helping local people to understand the threat that fracking poses to their health and wellbeing. 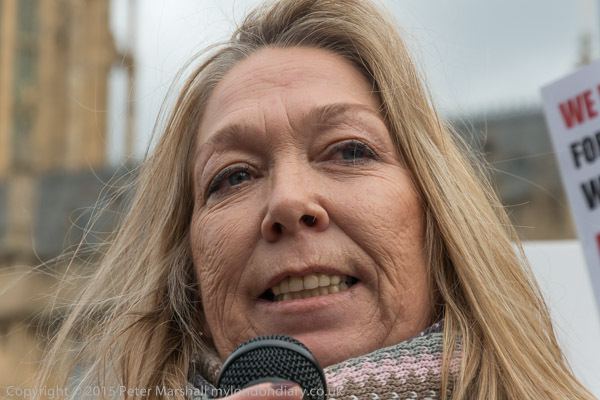 As a tireless anti-fracking campaigner, she has supported communities in setting up their own protest groups, helping to inspire a movement that has grown from a handful of anti-fracking groups to more than 400 today. 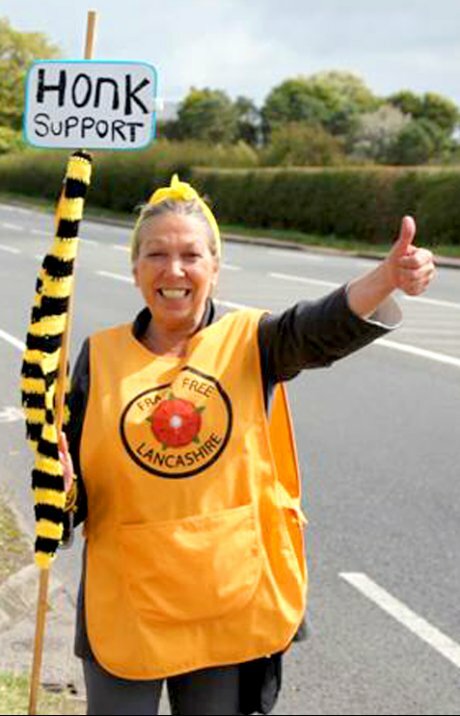 She lives in Blackpool and works with a variety of groups, including the ‘Nanas’.